Antigen is essentially a protein and it is processed by APC (antigen processing cell).This is important for engaging the adaptive immunity. 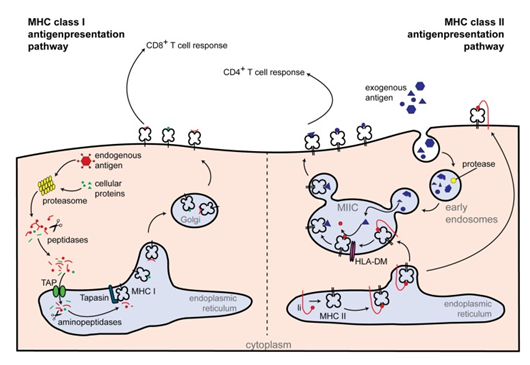 The adaptive immunity has few key elements which are a) specificity b) memory c) diversity d) self/nonself discrimination .In order to make successful execution antigens are processed and presented before they are acted upon by immune cells. Ingestion and digestion of the antigens by APC to convert it into peptide molecules .this is done by MHC class 1 and MHC class 2 molecules. The functions are similar in both cells as both are same as they both form the short peptide chains still a minor difference lies in the approach that is origin of peptides are different in both as it is endogenous/intracellular in MHC class 1 and exogenous/extracellular in MHC class 2. 2. APC or Antigen presenting cells are those cells which can process antigens into smaller peptides in concurrence with MHC class 2 molecules so it can interact with T cell. Professional APCs and nonprofessional APCs. Macrophages, Dendritic cells and B cells are the professional cells. These cells are primary APCs for T cells. Nonprofessional APCs are those which are active only for brief period in the process. Thymic epithelial cells and vascular endothelial cells are the examples of such cells. 3. MHC class1 molecules are produced in all eukaryotes as the primary reason is they are produced in Endoplasmic reticulum. It consists of two types of chains one is beta2-microglobulin and another polymorphic heavy chain .calnexin and calreticulin are the two molecules which help in stabilising it and are known as chaperone proteins. As it is seen in the figure a complex is formed which is called peptide-loading complex .it is made up of calreticulin ,Erp57 ,protein disulphide isomerise and tapas in .interaction between tapas in and TAP translocates peptides from the cytoplasm into ER . peptides which are formed can be viral or self origin Degradation is cytosolic resulting in the peptides formed and translocated to the ER . Once the MHC molecules express themselves the Tells undergo rearrangement process in the antigen receptor .MHC molecules self test the Tells and if the Tells are efficient enough then Tells are provided with the signal cells . If the signal is not available then the cell may die due to apoptosis . Another round of test for Tells happen by MHCs for reactivity against the self peptides and high affinity for this may result in apoptosis . After such two tests it is determined whether the T cells are mature enough to handle the foreign peptides or not . Peptides which are presented by MHC1 are generally 9 amino acids long. Peptide binding cleft in MHC 1 is closed . The processing is endogenous and it uses specialised endosomal components. endogenous pathway for the presentation involves the process where the viral protein is lysed inside the cytosol of the host cell and taken away further in the endoplasmic reticulum. The enzyme for the lysis are called as proteasomes and is present in the cytosol as the result of the process peptides of 8 to 10 amino acids are produced .Peptides now move to the ER with the help of a transporter protein. This transport is mediated by chaperonins which make sure that these peptides are protected from the heat shock and protect those peptides from degradation. In the ER the peptides combine with the MHC1 and form a stable complex and are transported to the Golgi complex for the cell presentation to the Tells. 1. Antigen processing is a complex process in which antigens are prepared to be presented to the Tells . Here important point is unless antigens are processed they cannot be presented ,by presenting mean processing into smaller peptides .The Tells can only recognise the linear peptide chains . There is one more requirement involved is that Antigen presentation should be combined with class 1 or class 2 MHC molecules. 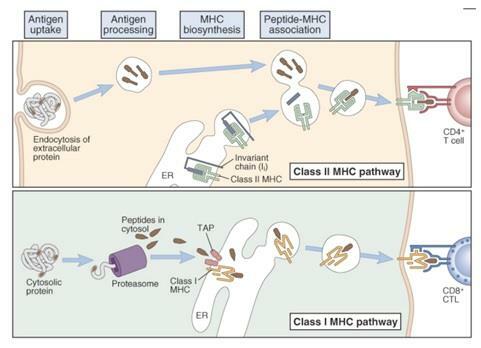 The basic pathway followed by both MHC 1 and MHC 2 are same apart from the fact origin of peptides will be of endogenous in origin in MHC 1 and exogeneous in MHC 2 . As an established fact Tells can recognise only one peptide but this is not true with MHC molecules as they can bind with multiple peptides . Immunology is a study of keen observation ,understanding .Keeping updated around the scientific world basically the field of immunology is extremely crucial . As no two viruses are alike ,they have different metabolic pathways and it is very much possible that how they are going to react to the immediate environment . 2. Microorganisms are quick to adapt the change in the environment .Scientists all across the world are doing researches and according a recent finding antigen presentation is no more of hematopoietic origin it can be fibroblastic reticular cells ,lymphatic cells and blood endothelial cells .All these cells together are called as LNScs or lymph nodal stromal cells . LNSCs are perfectly capable of presenting the antigens and also establishing it to Tells . The lab should be fully equipped with the right material required because immunology as a whole is very sensitive towards it .